If you heard about the release recently for the Ninja SLX Tanks and have been waiting to find out more, the wait is over. The SLX is a very limited edition gold tank that is limited to a total of 400 pieces across 2 different size bottles. Not only are you getting the gold tank, but the traditional black Ninja regulator has been replaced with bright gold shiny regulator that has been polished. These tanks will never be produced again and are going to be selling out really quick. Out of the 400 total tanks, about 300 pieces will remain allocated to the United States with the rest being sent to other countries. The SLX tank was the brain child of Ninja paintball to give loyal fans something special to celebrate their 10 anniversary of the brand. These tanks are retailing for $239.95 and can be found at large online retailers like ANSgear.com. Check out the all New HK Army Microfiber Paintball goggle cloths. HK has been coming out with a ton of new paintball gear all summer long and these new microfibers look great. Tons of new food themed and crazy designs. The one pictured is the HK Arctic color and is proving to be one of the more popular versions. For only $9.95 this really is a steal of a deal for any serious baller. 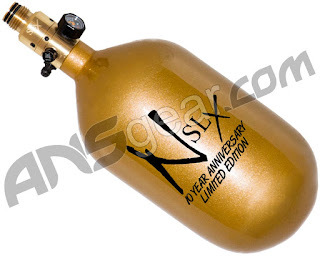 Check out the full exclusive collection at ANSgear.com to make sure you get the best possible pricing.